Worried about mud, bugs, and the uneven surface of the camping region? Hammock camping allows you to rise above all these worries and spend your camping time under the glittering stars. Some people assume camping on ground to be the best possible option, but when the ground is muddy and you are camping alongside the fear of insects, the best hammock tent might come to your rescue. Not only are they an easier and more affordable option than more traditional camping gear such as tents or RVs, they provide a great night’s sleep and can bring you closer to the great outdoors. Hammocks are proven to give you a more ergonomic and sound sleep, because you are suspended in air and aren’t subjected to the hard ground and rocks below you. This is just one of the many benefits camping with a hammock tent can bring. Being the epitome of relaxation and comfort, a hammock is the perfect option for your next camping trip. 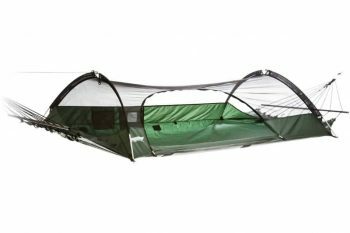 The best hammock tent is one that is sturdy, comfortable and affordable and here we have reviewed some of the suitable ones available in the market. Even though hammocks are quite popular with campers, some people still find it difficult to get a quality one. There are so many options in the market, but you can’t just pick any of it. For a quality purchase, take these few features into consideration. When talking about hammocks, size matters. If you are a particularly tall or short person, this is something that you should think about when choosing a hammock tent. If a hammock is too small or short, you simply won’t fit. And if a hammock is too wide or long, it can wrap around you too tightly. If you want to sleep with somebody else in the same hammock, you should get a double hammock that is made for holding two people at once. Hammock setups weigh lighter than 7 ounces, and some companies even release ultra light weights. However, when you buy one, make sure you have added the suspension weight to the real weight of the hammock. It is going to add 10-15 ounces. You should always read the recommended weight capacity limit for the hammock tent you buy. Two people should never sleep in a one-person hammock, or load a hammock with more weight than it can handle. Not only can this be dangerous and possibly result in injury, but it can also reduce the quality and longevity of your hammock tent. Also, if you are planning to lounge more often, look for a heavy duty one. Generally, Hammocks come in two types of fabrics – cotton and nylon. While cotton hammocks are good for lounging and relaxing, the nylon ones are meant to be lighter and water proof. To make the hammocks lighter, most of the latest hammocks come with nylon fabrics. If you chose a cotton one, it would probably be heavier, bulkier and comparatively lesser room for you. On a personal note, you should look for the nylon hammocks as they are highly durable and even repels water. Even in the toughest conditions, it is going to survive for a couple of years. When you setup the hammock, it needs a sturdy suspension system that comes equipped with a pair of carabineers. Some of the hammocks come with webbing straps, while others come with synthetic tree slings. If it’s a webbing strap, it should be wider than 0.75 inches and if its nylon rope or webbing strap, beware of over stretching. Look for hammocks with a number of attachment points so that you can adjust as per your need. Due to most hammocks’ nylon and lightweight material, hammock tents are ideal for keeping you cool and breezy during the summer. But if you’re thinking of going hammock camping in the fall or winter months, it’s a good idea to make sure your hammock tent comes with an insulation accessory. These can include sleeping pads, under quilts or top quilts that all provide an extra layer of warmth between you and the cold. Without much ado, let’s start with the list of most recommended products. Description: The Grand Trunk Skeeter Beeter Pro Hammock with bug net protection is the perfect choice when you plan to lounge more often. Ideal for relaxing when you are camping, hiking, and traveling, this is the right alternative to your tents and sleeping pads. Some people consider it way too expensive, but for the perks it gives, the price is worth. This hammock is known for doing exactly what its title suggests – keeping out even the tiniest insect from crawling into your sleeping space at night. The hammock comes with a quick and easy setup and can be used anytime and anywhere. High-quality nautical grade carabineers and starter rope kit are attached to the hammocks to make the setup easier. 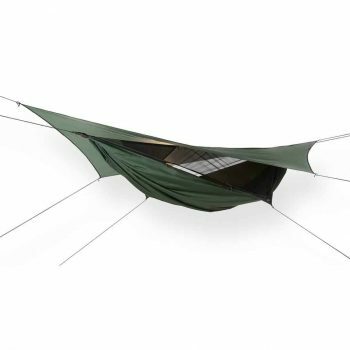 Besides the package weighs 1.8 pounds, this hammock supports almost 400 pounds. This is great when you are looking for a hammock that could support your camping purpose on a long run. As per the size, it’s the multiple ties that give the hammock enough space to be in comfortably. The hammock is made from 100% parachute nylon and can survive even the worst climatic conditions. The hammock shape is more traditional, meaning it’s harder to lay flat. But some people don’t mind doing the banana bend and find it quite comfortable. It’s a long hammock, meaning that it can fit even the burliest of campers. If you’re just beginning to explore hammock camping and aren’t looking to make a huge investment, this hammock is the hammock for you. Related: There is a collapsible stool bought with this product – the Grand Trunk Collapsible Camp Stool. 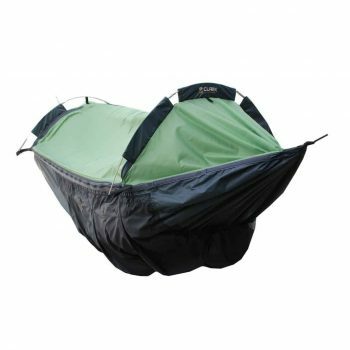 We recommend this for your camping as it is going to add extra comfort to your session. Compact and portable, this stool can be stuffed in your bag pack as well tote bag. Description: Hennessy is known for making minimalistic and lightweight hammocks, but don’t be fooled by the light weight nature of its hammocks. When going on long backpacking or hiking trips, you should pick the lightest weight, which is why the Hennessy Hammock Explorer Deluxe Hammock is the perfect hammock for those longer trips. We consider it as one of the most comfortable hammocks around. The hammock is light, portable, and holds enough space for you to lie down comfortably. We like the entry with classic side zipper closure that allows you to get in easily. The 210D Oxford nylon used in the hammock allows it to perform even in the worst weathers. Provided it is nylon made and Polyurethane Coated, it withstands the impact of weather. On a long run, it is a good choice, keeping you comfortable inside. Even though the hammock is 2.4 pounds, it can easily take in 300 pounds. However people who are taller than six ft have found slight issues with the hammock. Before you buy it, focus on the height. Related: Hennessy sells this product in two types, Classic and Zip. The Coyote Brown hammock is made up of the same nylon fabric as its twin. Hence you can expect it to be weather proof. Description: For those campers who can’t decide if they prefer camping in a hammock or a tent better, the Lawson Blue Ridge Hammock has found the perfect middle ground for you. Not only has it been rated #1 by Backpacker, Outsider and American Survival Guide, but it’s also the winner of the Gear of the Year Award. And it’s easy to see why. This hammock tent is constructed with a unique arch pole and spreader system that makes it easy to hang it between trees as well as lie flat on the ground as a tent. Experience is extremely elevated because the Lawson comes with a detachable rainfly and a no-see-um bug net. With all the required protection associated, you can spend quality time even in the woods. Since it is made up of nylon, you can figure out the hammock is pretty resistant. Plus, it is very light weighted, letting you set it up quickly and easily. The arch pole system and spreader bar keep the bed flatter and tout so that you can lie down comfortably. Most of the hammocks cause a banana position, and if you don’t like that much, then this hammock can be your choice. This is a hammock tent for those campers whose priority is to sleep in a flat position. Available at approximately $199, the price is debatable, but when you don’t want to compromise on comfort, this is the perfect buy. The bed size is approximately 90 x 42 inches, which will support approximately 275 pounds. For us, it’s a complete win win purchase so you really don’t need to worry much. Related: The product is often bought along with Hammock Pawleys Island Starps. These are a must have when you are trying to hang the hammock to the tree securely. The good part about these straps is they will hold your hammocks without harming the tree at all. Description: For a serious camper, there can’t be a better choice with the best hammock tent protection you can find. This hammock is built to be camped in all four seasons of the year, even in six-foot-deep snow. If you’re a serious hiker or backpacker, looking forward to go on long expeditions, the Clark NX-270 Hammock is an investment worth making. This hammock has a breathable Weather Shield layer that zips over the full coverage no-see-um bug net, and a rainfly for the ultimate level of protection. These extra layers substantially transform your hammock into a swinging tent cocoon, covering you on all sides from unwanted elements. The hammock comes with a removable insulating pad and six large pockets underneath it to store all your gear. It even includes flexible poles that widen the hammock, making more room for you to move around. If you’re a serious camper looking to make an investment on a heavy duty hammock tent, look no further. 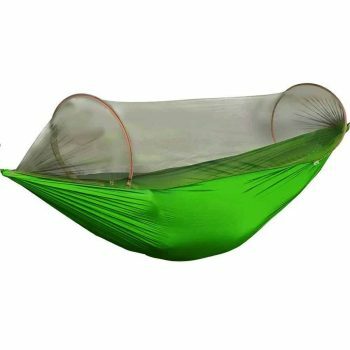 Related: The Snugpak Jungle Hammock has built in mosquito net and all arrangements for comforts that you can seek in a hammock. It is perhaps the simplest solution to camping in woods with 4 pieces of 10’ long guy rope and 2 feet carabiners. Even though the weight of hammock is 1.75 pounds it is likely to support 400 pound weight capacity. Description: The Hennessy Hammock Expedition Hammock is a cousin to the previously mentioned Hennessy Hammock Explorer. The main difference between these two is the weight and price. The Expedition series is cheaper, and also heavier. That being said, it’s a more budget friendly option of the Hennessy Hammock tent series that provides the same trusted Hennessy quality. 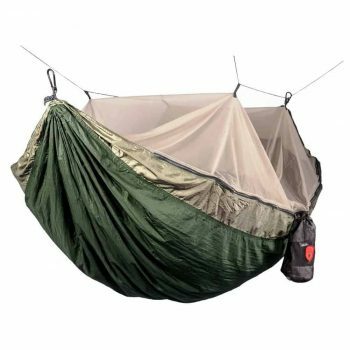 This particular hammock tent is extremely versatile, with an attachable mosquito net, a detachable rain fly, support ropes, and a place to store your stuff. It’s constructed with their patented “easy enter, easy exit” and “never tip” technology, meaning that even the clumsiest of campers can maneuver around this hammock tent without a problem. We like the webbing straps and mesh pocket on the ridgeline that protects the bark of trees from being ruined. So, along with protecting you with its nylon fabric, the hammock is nature-friendly also. Provided the hammock is sturdy, it can support weight up to 250 pounds, which is good for a single person and if you are thin, then two people can quickly adjust. The downside is if you are exceptionally taller, it is going to be difficult for you to adjust in the sleeping bag; else it works well for everyone. Even in the heavy rain, you won’t get a drop of it inside. All over, it works well even in the bad weather. Related: People often buy the Hennessy Snakeskins #3 with this product. Its instant stuff sack system lets the Hennessy Hammock collapse in less than 30 seconds. With this product in access there is not even the slightest chance for your hammock to touch the earth. The tapering tubes amazingly take in the entire setups in minutes. Description: The Tentsile Stingray Hammock Tent isn’t your average hammock tent. This tent is designed to lay completely flat on the bottom, much like a traditional tent, while being suspended in the trees. This hammock tent is not just heavy duty and durable, but also has the ability to carry around a lot of weight. Credit its two aluminum, Featherlite poles that support the weight of up to three adults. The floor area is approximately 75 ft square, which we think is sufficient for you to lay down comfortably. This is a great option for those interested in hammock camping as a social activity. It’s perfect for your kids to sleep with their friends, and cozy enough for the whole family to snuggle in. 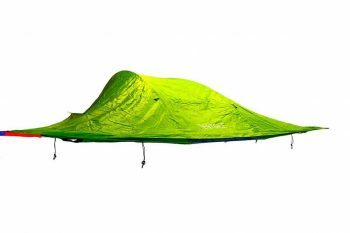 This tent isn’t necessary the best option for long hikes or backpacking trips but works perfectly for casual campers looking for a great place to sleep in the trees. Also, it comes in 6 different colors so you can pick the one that suits you. Related: Tentsile Hatch Cover is one often brought product along with the Tentsile hammock. This floor hatch cover attaches the Velcro pad at the end of central mesh to block the cold wind from winter weather. PU coated polyesther nylon composite is best suited in the winter conditions. Description: This Hennessy Hammock Safari Hammock was built with space in mind. It’s the Hennessy series’ deepest and widest hammock, making it the perfect choice for people on the upper side of weight scale and couples. It comes with a detachable rain fly, support ropes, and a sack to hide away your stuff. 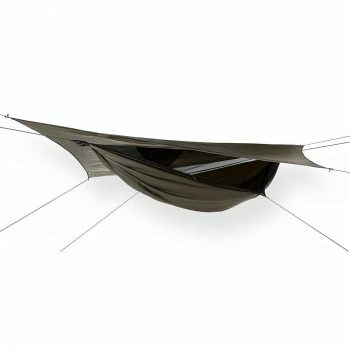 The weight limit is 350 pounds, and like the other Hennessy hammocks it boasts an easy setup and durable quality. This hammock tent isn’t as lightweight as the Explorer or Expedition series, but for what you’re gaining weight, you’re gaining in space and comfort. Even though the packaged weight of the product is 4.3 pounds, it can take up at least 350 pounds in total. As per the entry, you will have to enter from the bottom side, which is held by Velcro tightly. Provided the hammock is attached to inbuilt mosquito net that will keep the bug away, you are likely to have a comfortable night inside. One thing that we like about Hennessy is it cares about the tress also with its 42 inch long “Tree hugger”. 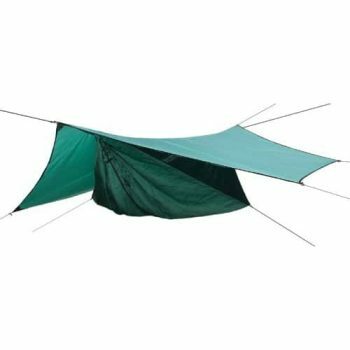 Description: Perhaps the most budget friendly hammock tent on this list, don’t let the ASYM Classic G4 Hammock tent’s price fool you. This hammock comes equipped with a shock cord and carry pouch. It’s constructed out of highly durable and rain resistant parachute nylon and boasts a large bed of 118 inches long. Not only is it relatively light, but it’s also compact to folding into a neat carrying pouch that is easy to transport. This hammock tent can also be used for a variety of functions including a normal open hammock by putting the mosquito net on the bottom, a hammock tent with the mosquito net up, a lounging seat, and a sleeping bag when used for lying on the ground. With a 100% money back guarantee, this hammock is a wise investment for those wanting an introduction to hammock camping. Related: The G4Free Outdoor Camping Pan is one of the highly bought products. Both the pots have folding handles to increase the compactness. This set is perfect for backpacking, hiking, and camping and can also be used as a part of survival kit. You can put in salts, sponge, pepper, and many other things in the pot to make room. Hammock camping is an excellent way to reconnect with nature and be comfortable while doing it! This guide is meant to help you choose the best camping hammock tent for your needs. With all the different options available, it can be hard to choose just one. Keep in mind the price, materials, and accessories when thinking about buying a camping hammock. Whichever hammock tent you choose, your next camping trip is sure to be full of great memories and restful nights. What’s your favorite hammock tent and why? Let us know in the comments below! TOP GEAR PICKS Best Hydration Drink: The Art of Proper Hydration!